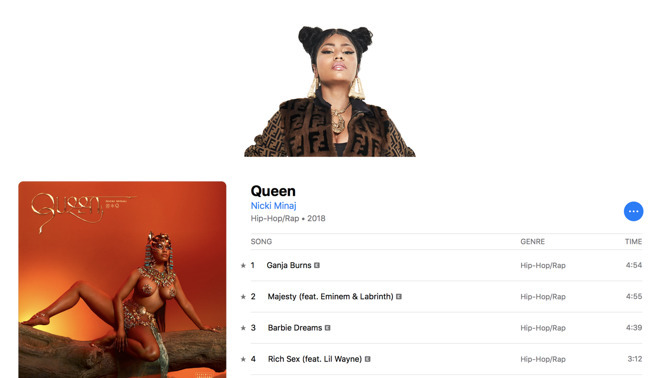 Popular artist Nicki Minaj last Thursday debuted a new show called "Queen Radio" on Apple Music's Beats 1 station, in conjunction with the release of her new album, "Queen," on August 10. Now, the artist is accusing Spotify of retaliating against her for the Apple deal by not promoting her music aggressively. Minaj went on to blame Spotify, at least in part, for the album coming in second on the Billboard charts to Travis Scott's "Astroworld." The accusations from Minaj came in a series of tweets Sunday night. Spotify put drake's face on every playlist but told me they'd have to teach me a lesson for playing my music 10 mins early on #QueenRadio. Even tho they've been giving away my music for free for years & I am one of the top Spotify artists of all time. Beats 1 recently hosted a promotion for the album, which got the hashtag #NickiDay trending worldwide on April 13. Nicki Minaj's Queen Radio show returns Tuesday on Beats 1. This is only the latest skirmish involving Apple Music, Spotify, and the way exclusives with major artists remain a weapon in their battle with each other. In June, Drake's new album "Scorpion" had almost 25 percent more streams on Apple Music than on Spotify. Spotify has been accused of retaliating against artists with Apple Music exclusives before. In August 2016, artists said they were told that Spotify would "bury" their music in its search rankings if they did Apple Music or Tidal exclusives, once the music arrived on Spotify. Spotify strongly denied the report at the time. Spotify went on to start offering its own exclusives with artists the following year.